Author Ginger Gaines-Cirelli pastors a church in the heart of Washington DC, adjacent to the White House, which actively works to bring justice and help for marginalized communities, refugees and immigrants, and the endangered earth. She inspires and leads this work through preaching and by organizing and developing strong leaders, deeply rooted in a well-developed theological understanding. Pastoral warmth and compassion characterize the recommended practices. 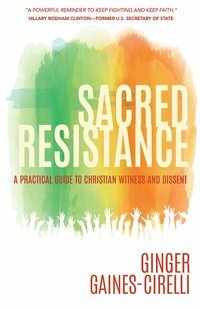 Sacred Resistance addresses these questions, among others: -When Christians see that something is wrong in our nation or community, how and when should we respond?